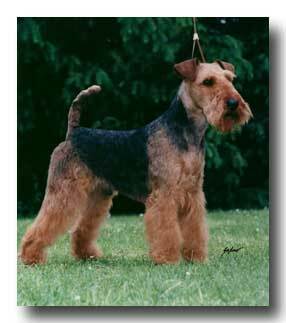 The Welsh Terrier looks a little like a miniature Airedale Terrier: compact and rugged looking, with a wiry coat. The head is long, flat and rectangular, with bushy eyebrows, mustache and beard. The v-shaped ears fold forward. The nose is black and the almond-shaped eyes are small and dark. The top of the back forms a straight level line. Puppies are born almost all black. The extremities lighten gradually, leaving a black "jacket." The tail is docked and caried with exuberance. Loving, loyal and hardy are descriptive words. They are patient with children and can withstand a bit of rough play. 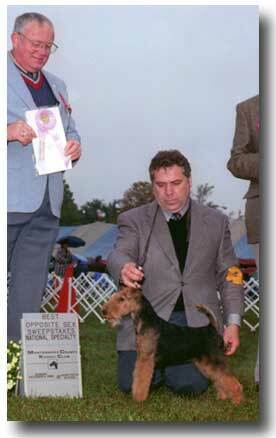 Welsh Terriers are curious and playful. Happy, energetic and spunky, they are best with an active family. 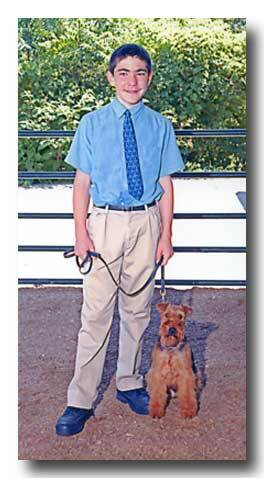 The AKC standard for the male Welsh Terrier is 15" - 15-1/2" in height and 20 - 21 pounds in weight. Females are proportionately smaller. The normal life expectancy is 13 - 15 years. They love exercise and like to chase after things. They need to have their coat plucked or clipper groomed every three to four months. 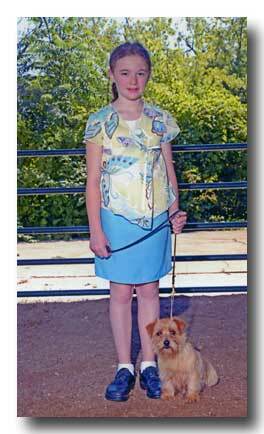 The breed sheds little or no hair. They are good watchdogs, love people, and make themselves right at home wherever home happens to be. The Welsh is playful and fun-loving, but not hyperactive. Part of their charm is to be everything at once: a happy dog, a quiet companion, a protector of hearth and home, naughty, mischievous - and fun!